Here, some of the most common reports are glossed over (lack of time) to explore and clarify a few central points - this might be useful to get a fuller picture, but wont provide one in itself. At right, as famously seen holding the twins before they were buried - he doesn't seem to really resemble them. Ahmed has strange marks on his face, like a scraped cheek - livor mortis, was left laid face-down for some time after death, for what it's worth. This case is different from those, either from being true or being a better-planned fake. CBS News interview (Youtube video), adds photos of Abdelhamid al-Yousef, or a good lookalike with similar (or same?) black jacket, posing with the babies, and all seeming happy like a family. 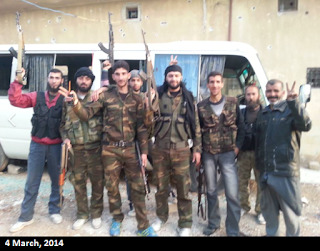 (one at right - note: Alaa al-Yousef is a journalist on this report, unrelated) (note 6-22: along the way I learned he's local, more an "activist," and a cousin of Abdelhamid's in the same town, who also claims to have mild (secondary) sarin exposure, and went to Turkey with Abdelhamid, etc. However, that doesn't prove he's their father. This family could have been kidnapped recently, or even before the babies were born, and he could have been the friendly kidnapper who could make the kids smile, take selfies of it, and build himself into a well-planned story of their impending death. That's "for all we know." Other options exist, including his being their father, or some cousin, or a truly sympathetic "social worker" the Islamists had working with this former Shi'ite family as they tried to hold to their forced conversion to Sunnis. Again, "for all we know." Okay, that's the provocative intro. The rest is semi-sorted explorations. See also good stuff coming together at ACLOS talk page. The controlled media's message so far is he's their father - fact. Call it fake news if you must, but this isn't a known fact. No photos of the whole family to see if the wife is as good with easy, baby-like grins, for example. A lack of resemblance, ... maybe more I'm not seeing yet. This isn't as bleeding obvious as most cases I've tackled. This gives "Abdelhamid Yousef, 28, who lost 19 members of his family and relatives." It says it's the day after the attack (April 5) and he's "inside the house of one of his relatives." as he says "My parents, Ahmad, Ayya (the twins) and my wife Dalal were martyred." "We thought at first that it was like all the strikes or a regular raid," he said. "I saw my family and the family of neighbors outside." "I went to the house of my brother, then I went to the first group and asked for the second ambulance, but I (grew weak) and I collapsed here." Note: Most other witnesses describe a clear and unpleasant smell and yellow, irritating gas, clarifying the toxic nature of this event. He ... didn't notice that? 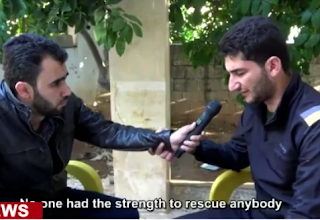 Because he's been told the regime's sarin is colorless and odorless, so he describes it that way? compilation graphic - not all scenes, but a few, emphasis on the two different outfits - He does another interview seated on a porch in the same outfit, wearing headphones (presumably to hear a remote interviewer?). He seems to have spoken to many outlets here, including to Hadi Abdullah again. He's widely filmed in the same outfit weakly visiting the grave of his twins, so they're already buried and this must be April 5... A busy day of grieving and educating. A scene G (not included, BBC video) shows him dressed the same and tuckered out after all this activity, resting with an iv drip connected to his left hand. From all this, I propose the othe other intubated scene is prior to this, so the last scenes of the day are A and then G.
But he's getting IV treatment a day or more after the event? Sure, that's plausible - depletion of various nutrients, etc. might require continued treatment. And because that makes sense, it may be a visual effect they concocted. And maybe ... this is the last of the watered-down sarin they smuggled into his bloodstream over a couple of days before sending in for testing (see below). So back to the scene with the red jacket where he buries the babies - I haven't done any timeline analysis on dates, upload times, other relevant evidence times, but ... is that the day of the incident? 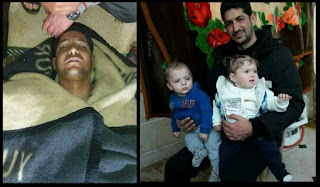 He was given all-unseen treatment from actual sarin exposure, reunited with his babies, and did that burial photo op within ... same day (near sunset)? Next day (near sunrise or sunset, depending)? Either way, it seems to me all the yellowjacket scenes were the following day. If so, the STF News argument is nullified. That outfit isn't what he was wearing when he was allegedly gassed, and the tubes are for some later treatment. In fact, even the clothes he buries the babies in may not be originals - they seem almost conspicuously ill-fitting, odd slippers, slacks too short, light jacket, too short in the sleeves. It looks pathetic enough I wonder if someone rich donated the snazzy suit he was seen in next day. But what was he wearing at first? Maybe ... they're even smart enough to consider the SLUDGE syndrome this time, as they never have before. Even in this attack, otherwise, the shown victims display no signs of serious vomiting, drooling, tearing eyes, urination, or diarrhea. But maybe they have a secret photo of Abdelhaimd in his soiled original clothes, being handled by people in hazmat gear just after the alleged sarin attack. I doubt they went this far, but... it seems they may have gone some distance for once, and I feel like not underestimating it. After all, this is a big deal story - Ghouta 2.0. So if they do have this, release it and shame us for embarrassing the poor bereaved father, I still call fake. He probably just overdosed of coffee and diuretics, castor oil, whatever, after eating lots of food, or some similar kind of trick. Promoted to Turkey: The Proof Man Down The Line? But I presume he wasn't there just for media appearances or more follow-up medical help - he was probably getting tested for sarin exposure, with an eye to giving those results a media appearance. Why claim sarin, go to Turkey, and not get a positive result reported? It's quite easy to do, at least relative to the possibly immense payoffs of a lie this big. In one video he's seen sipping water, as shown here. This isn't odd, except it might be. Either way, it reminds me of my own theory of the easiest way to fake a sarin test in support of a fake attack story (see the sarin evidence). 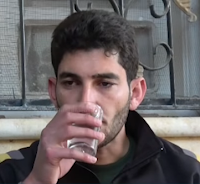 You sip a weak dilution of sarin in water, or some tea maybe. Allow a few minutes between sips for each micro-dose to be metabolized, and the effects will be minimal - just brief tinglings of the real thing, likely with some cumulative issues as you sip for ... a few hours? Off and on for a few days? I don't really know. 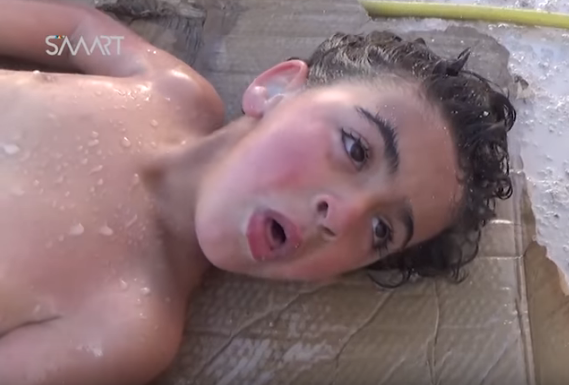 Whatever it takes, it's an easy way to voluntary sarin exposure, to get those molecules technically inside in the body of an allied person willing to tell the false story about this "Assad regime sarin attack." Story and *scientific proof* in one place. Bingo. And this might be just how "Abdelhamid Al-Yousef" got the positive results I expect he yielded. FWIW: in the first scenes, he puts on a pathetic show, skinny and weak, wobbly, requiring help, and everyone helps - He was likely skinny and weak before, some preexisting issue - he also seems unusually prone to sweating here all through his meeting with Erdogan - possibly a drawn out mild sarin crisis, or just his preexisting issue, or something else. The metabolic process will ensure the test cannot specify if it was military-grade or terrorist-made (but then, OPCW and other authorities seem to admit it's terrorist grade and just being used by "the regime" anyway). Nor, I think, will it show if it came from a bomb dropped near him or from something he volunteered for, nor just how much there was and how quickly it hit him. 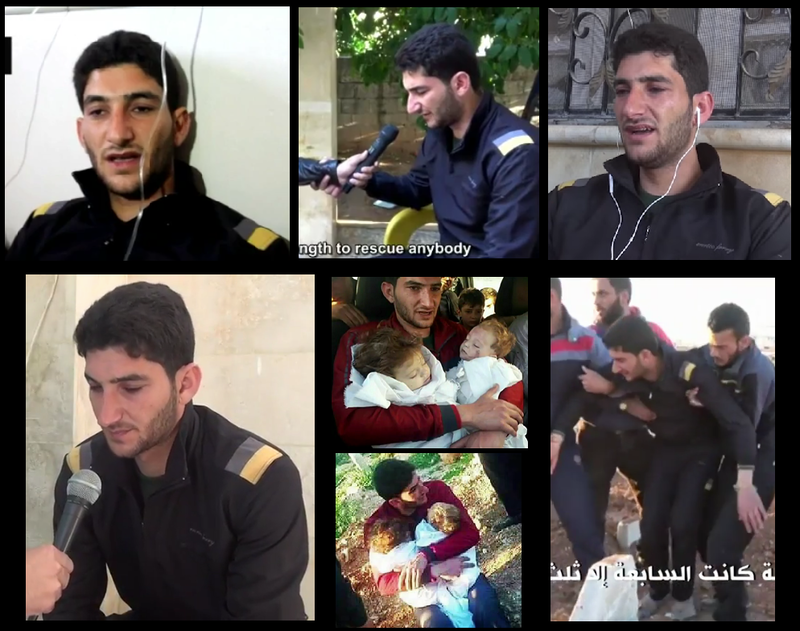 In review: He has himself in photos with the dead kids - seen burying them, visiting them there, telling the story over and over - he's well set to be the proof man down the line - his story has sarin, I predict his blood will show it too, and he'll make the news again as a science-confirmed victim of "just what we all said" - and my best guess how he got that way is a slow-motion voluntary exposure to a moderate dose. There's another surviving Abdul Hameed Yousef (same name, different transliteration, different man, presumably different middle name? 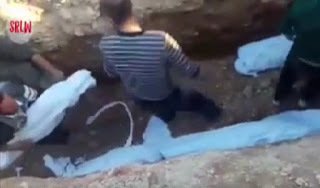 ), and an Abdelqader al-Yousef - are among at least six surviving men and two teenage boys of the family, who claim they were in the sarin plume and effected, saw people die all around them but all survived fine, with a few surviving women spoken and children for but not shown, and most women, children, and elders reported dead (again, ACLOS). The reality of this "Al-Yousef family" is really being driven home here, heavily-sponsored with promoted alleged witnesses. This is frequent to higher-profile marketed massacres - it's said this is the largest family around, which means the most common name - it's a large rug you could sweep other IDs under - I suspect there's a single family with some 22-28 members killed, and their name is not Yousef at all - in fact, I suspect it's something everyone would recognize as members of a minority group, and hence all these efforts to assure us those were all some of them Sunni Yousefs. This guy Abdelhamid kissing Erdogan's head and praising Trump's air attack, would clearly be the leading edge of that effort. 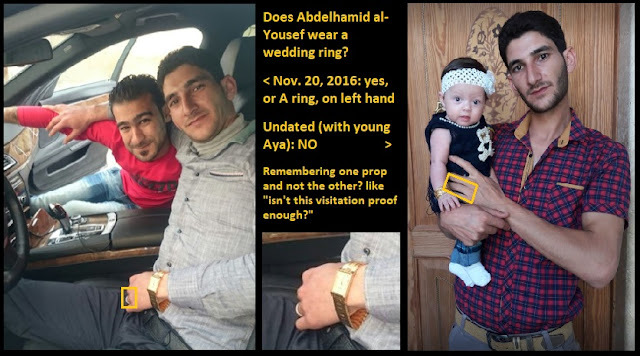 There's also an older brother, Abdul Karim Ahmad al-Yousef (30, to Abdelhamid's 28/29) who reportedly died alongside his unnamed wife, but not any children. (ACLOS list). He's seen in a photo posing proudly with his brother's alleged kids, as if to say "see, I am too their uncle." (Facebook) But unlike Abdelhamid, this brother allegedly died. He's shown in a photo dead, but looking possibly alive and just drugged (via ACLOS). Important link established: Abdelhamid's children and wife are apparently seen in a gruesome scene, loaded in the back of a van with four alleged neighbor girls (Al-Saleh) said to die with them. The wife and one Saleh girl are bleeding from the nose, which is not a sarin symptom, and there are some indications they were executed hostages. See the hostages in Abdelhamid's house? Let's consider the Invisible Marriage said to spawn Ahmed and Aya. I think we've seen about a dozen photos of Abdelhamid with the twins, and even one of his similar-looking brother Abdelkarim with the them, besides several of just the twins. But there are still none of him and the wife, the wife and the twins, all of them together, or the wife at all. I think that's a clue. Captive babies just months old can just blithely smile with the friendly kidnapper easier than captive moms with deep, sad stories in their eyes. It could be that more were tried, but none of them looked right. 'I cannot forget my martyred wife and children, and my brothers, and their wives and children', he said. But he does not even have any photos of his beloved wife of two years left to console him, as they were all destroyed in the attack that ripped through his hometown. He had all these pictures and videos of the kids on his phone or online, but all pics of or including his wife, were only in print, and they all happened to burn. And this is in a fire not otherwise mentioned in his reports, just a safe-seeming place where he left everyone (in most versions of the story - see below). But now we learn, also, there was a fire raging inside as sarin seeped in and killed everyone... Huh! And that's why we'll never see his wife except dead in that van with a likely head wound. 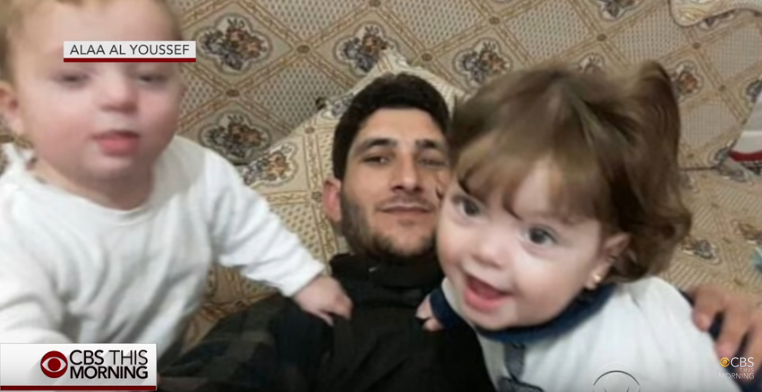 When the airstrikes hit, he was with the twins. "I carried them outside the house with their mother," the 29-year-old shop owner told the AP. "They were conscious at first, but 10 minutes later we could smell the odour." The twins and his wife, Dalal Ahmed, fell sick. He brought them to paramedics and, thinking they would be OK, went to look for the rest of his family. Why would he think they were ok if they fell ill for no clear reason, and he had to take them to paramedics? And if they had gotten any medical help, why did they wind up dying? In no other version does he mention this. Otherwise, they seemed so fine, he just left them at home, where they died with no help. He found the bodies of two of his brothers, two nephews and a niece, as well as neighbours and friends. "I couldn't save anyone. They're all dead now," he said. It was only later that his relatives could bring themselves to tell him that his children and wife had also died. 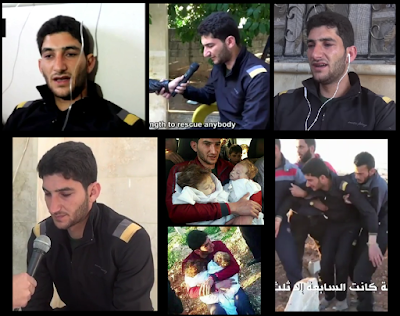 Abdulhamid al-Yousef... had rushed to help the other victims of the attack. He came back instead to find that much of his family had perished, including siblings, nephews and nieces. His wife and children had rushed down to the bomb shelter in their basement, only for the toxic gas to seep into it, which killed them all." Were the paramedics in the shelter? 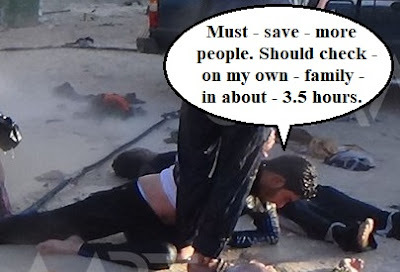 Heat destroys sarin, but this must have seeped in opposite from the side with the fire burning up his photos? "At 6:40 the plane hit my house. We didn't feel any gas or anything." He carried his wife and kids outside. "While taking the kids out, people told me there's another strike at my family's (parent's?) house. All your family are dead. People were collapsing while talking to me," but had learned a lot first. It's not clear what he did with the wife and kids here, presumably leaving them at home, maybe in the basement shelter. He ran to his parent's house and found his brothers Yaser and Abdulkareem, his niece Shaimaa, and nephews Hamoudi and Ammar, all dead. Then, he says, "I fainted" and stayed out of it for some time (maybe he means collapsed, without losing consciousness, as he describes below, and maybe he means fainted - which would be another story conflict). "I returned (home?) after four hours to ask where my kids were. I left them ok. I found them all dead. 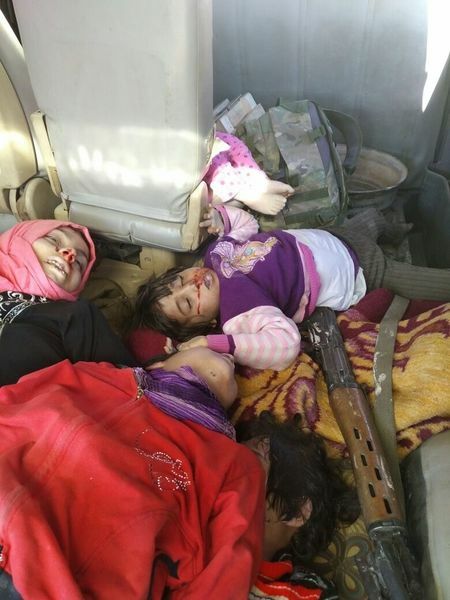 They suffocated to death by gas." "It was exactly 6:40 am. we were still sleeping... I woke up to the sound of the strike. It was near my house. That was the first strike." Note: the strike was only near his house, unlikely to cause a fire in his house, and he generally doesn't mention one, except when it's time to explain the lack of photos for "Dalal." "Five minutes later there was another airstrike. My parents live nearby. the second strike hit near their house. Five minutes later, there was a third airstrike near my uncle's house." "I gave the twins to my wife. They died. But at that moment they were still alive. I told them to go. I wanted to rescue as many people as I could." He was alright at first, and damn heroic, but he saw neighbors unconscious right away. 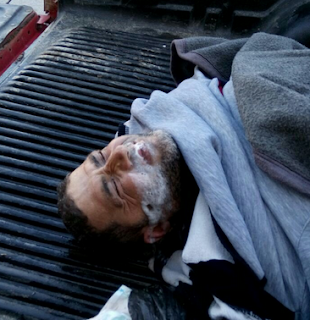 He heard it was sarin, put on a paper facemask, and kept "carrying people" who had been exposed, for some time. That makes little sense, of course - surface contamination would be almost certain. You feel it in a second, and you'll be paralyzed just as quick. But not with this everyday hero. "I couldn't go back to tell my family that it was sarin" because he was too busy rescuing others. Later he explains his cousin Ibrahim died, but Abdelhamid managed to rescue his wife, who survived. "The rescue car drove off" and then he headed to his parent's house. So that was at his first stop, his uncle's place. He skipped that in a version above. So he started at one strike, ran to his uncle's and then to his parent's house, visiting all 3 strike zones? One of the three strikes is about a kilometer south of the others. That's a lot of running to save people before all that sarin - which acts in fractions of a second - finally caught up with him. 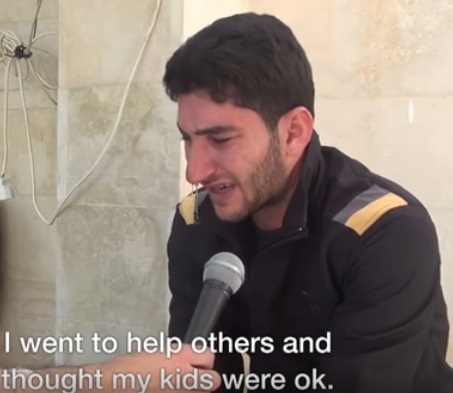 At his parent's house, he saw Yasser had died trying to save his youngest son Ammar. They had foam coming from their mouths and "their bodies were very blue." Abdulkareem, his niece, and also Hamoudi, were all dead. There were 4 or 5 bodies total there. A man he calls "Ahmed (Ahmad)" went to check on Hamoudi to find him dead. Abdelhamid's father should be named Ahmed, and he was in his house. But he calls his father "Ahmed," which is unusual, even for him - otherwise he says "my father." Is Ahmed a guy he's making up stories about, and usually refers to properly? Then they all couldn't walk. He tried to save his niece who was alive, but he collapsed while carrying her and then couldn't move, and she died. He didn't lose consciousness, but someone pulled him out and rushed him to a hospital where he saw people falling down. He's "not sure how long" he was there," but he asked after his family, and "they told me they were okay." "I checked on them before leaving and they seemed fine. They were going down to the shelter. No one knew about them. When I came back I was told they were at the shelter. We went to bring them out but found that they were all dead." In some versions, his wife and kids also died in the shelter, but were already found and shown to him, before he returned home (why?) and helped find the others .. that no one knew to look for, and didn't see? So, when did they all get photographed together in a van? It looks like mid-morning, around 9 or 10 am. He says he returned home about 4 hours after the attack, so around 11 am, and others already knew about his family, so must have had the bodies. But they didn't know about the Saleh kids... until Abdelhamid asked, in his grief, and someone told him they were in the shelter, so they went to bring them out, but sadly found they had died. Okay, so he'd say it's after this that they were all loaded in a van and driven to where the photos were taken. Do we buy this backstory? hearing from Abdel Hameed al-Youssef "a farmer" with a wife named "Tallulah" (possible honest error in transliterating Dalal). "Youssef and his wife woke up to an airstrike that hit just 20 meters from their home." They all went outside, the twins hanging around his neck, saw rubble all around, and started walking together. "They continued walking through the neighborhood when two more airstrikes hit nearby." There was no blast, just a strange smell and people starting to collapse. "At this moment, I felt something was wrong. So I handed over Ahmad and Aya to my wife and I told her to get away from here," Youssef said. "I told her to get to safety." 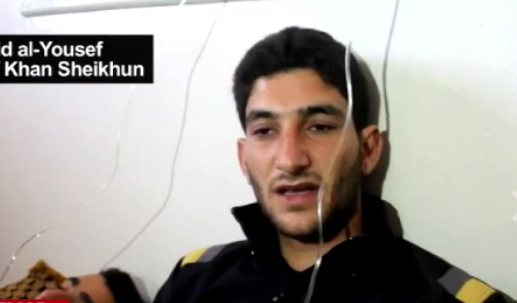 Tallulah took the twins and four of their neighbors' children to find a safe place, while Youssef rescued several neighbors ... ran to his parents' home ("about 100 meters away from the poisonous airstrike") ... hurried to another family member's home nearby ... "and then I fainted," Youssef said." After he came to, "first responders told Youssef that they found his wife with the twins and the neighbors' kids in a shelter near his house. Tallulah was still holding the children close but she was so ill from the toxic gas that she was unable to walk." The initial walk together away from their home, and the claim that Dalal was initially alive seem to be unique, but not specifically contradicted by any other stories. The latter might clash with the blood trickling from her nose, if it were from a head wound as I suspect. 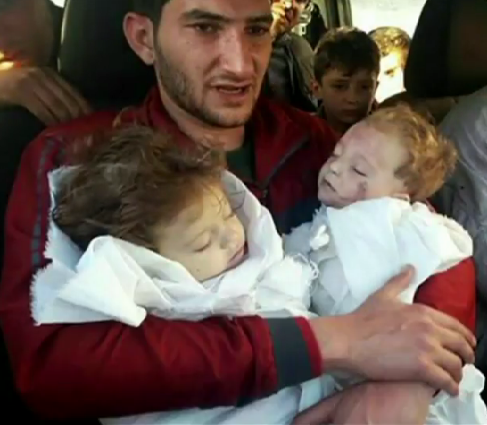 Her holding the children might clash with the way Ahmed was clearly left face-down for hours after death. But it's possible she held him until the rescuers showed up, and ... then he was left face-down for hours? 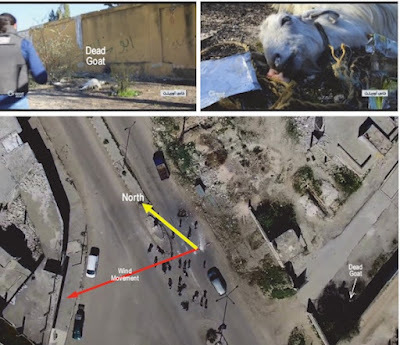 To develop strong livor mortis like this, it was probably at least 3-4 hours, and possibly much longer, if he were killed before the attack or if the photos of the bodies in the van were taken in the afternoon instead of mid-morning (this isn't certain). "The 29-year-old shopkeeper had been asleep with his family when the air strike hit close to his home just after 6.30am. They appeared to be fine, but as a precaution he took them all down to the basement of a nearby building in case of another strike. It was only then, an hour later, that they began displaying symptoms. “The family was all waiting down there and were safe, but then they started choking,” Mr Youssef’s cousin, Alaa, told the Telegraph. “The twins suddenly began shaking and struggling to breathe. 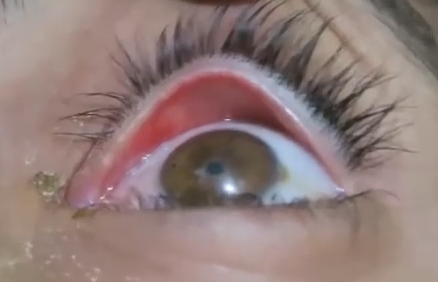 Then he watched the chemicals take hold of his wife, then his brother, nieces and nephews. Everyone died down there in the basement, they didn’t have time to get to the hospital,” he said." This is a seriously different story, but apparently second-hand. There's nothing else to say everyone got in the one shelter where the star witness personally watched them all die while surviving. When he's talking, Abdelhamid is pretty consistent he ran across town to two family homes next to each conventional strike and also each filled with the sarin and with dead family members, always thinking his own family was okay, vainly helping the others, until even his miracle protection finally wore off and he ... passed out for a while. It could be Alaa just had the story mixed up putting all of that in one basement. Alaa's story is a lot simpler than the Abdelhamid's, but the latter is clearly more relevant, and neither makes much sense. "Alyousef was at work when the bombs fell, but after his wife called him he rushed home. He was relieved to see that everyone appeared to be okay, but he led them all to the basement of a nearby building anyway – just to be safe. In an interview with the U.K. newspaper The Telegraph, one of Alyousef’s cousins said: “The family was all waiting down there...""
From there it's the same story. If the cited article ever said he was at work, it was edited later, now saying he was asleep, as all other reports claim. And even if the Telegraph did report this initially, it would be part of Alaa's mangled story that could be honestly confused. Add 9/26: A Speedy Recovery? Strong video evidence that IF Abdelhamid ever passed out as claimed, he was awake again within about 15 minutes. So why didn't he go save his family for 3+ hours after this? And why is he safe to touch so soon after running through three different clouds of sarin fog? Note: this should already have been up, but it's only partly up - mostly readable, but rough, and likely to be added to before it's done. It'll be worth a re-check in a few days. Shayrat Airfield in Homs province (Wikimapia) is where President Trump's hammer fell when he saw "baeutiful babies" die on rebel video. 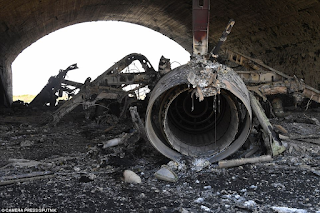 Some jets used in Syria's demonized struggle against terrorists were totaled, the airfield was damaged, a reported six soldiers were killed, nine civilians killed by errant missiles, plus injuries and damage. It could have been far worse. This was widely-praised, but people are widely stupid. Trump launched this strike in response to an episode he - hopefully - doesn't understand. Because much evidence suggests this was another terrorist crime, where they massacre their hostages and blame the Syrian government (see here for some of the better clues). Our information indicates that the chemical agent was delivered by regime Su-22 fixed-wing aircraft that took off from the regime-controlled Shayrat airfield. These aircraft were in the vicinity of Khan Shaykhun approximately 20 minutes before reports of the chemical attack began and vacated the area shortly after the attack. So two jets were overhead at the alleged attack time. This may well be. Implicitly, they dropped bombs at this time, but that's not proven. This is the central question: did any CW released actually come from those jets? The public confidence of any U.S. presidential administration definitely shouldn't be taken as convincing. It's the original reason to blame Syria. If instead some terrorist crime was carried out beneath a passing jet, unconnected to anything it was carrying, clearly it wouldn't be fair to target Syrian forces over it. There are various legal aspects to that, etc. ... but let's get to the meat of the question. "...a Syrian military source told Russian state media on April 4 that regime forces had not carried out any airstrike in Khan Shaykhun, contradicting Russia's claim." 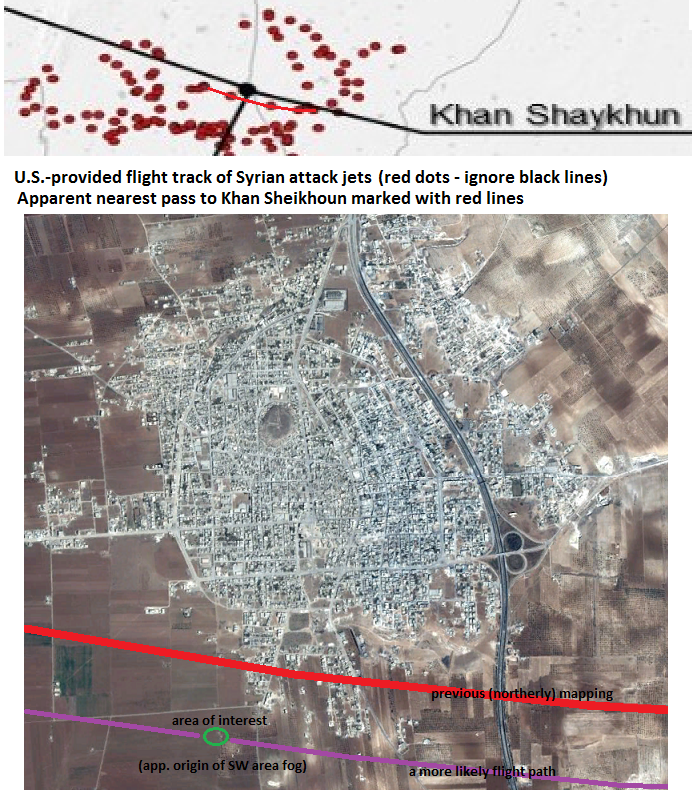 But if this happened early enough to explain that, it's a strike Syria denied. That's a problem, a disagreement between allies, if that's Russia's real story, and not an unfairly promoted theory. It makes the White House correct, if they had said "had not carried out any aistrikes at the relevant time." This, Syria does deny. Everyone agrees on a noon strike, and the US alleges an earlier strike, so we have two distinct times to consider. There were some additional words from Moscow about these chemicals being transported to Iraq, apparently a politically oriented message that shouldn't have been stated as literal fact (best read as similar...). Combined, it's an unfortunate answer, and gives the White House and others some basis to claim Russia is trying to "confuse" the issue. 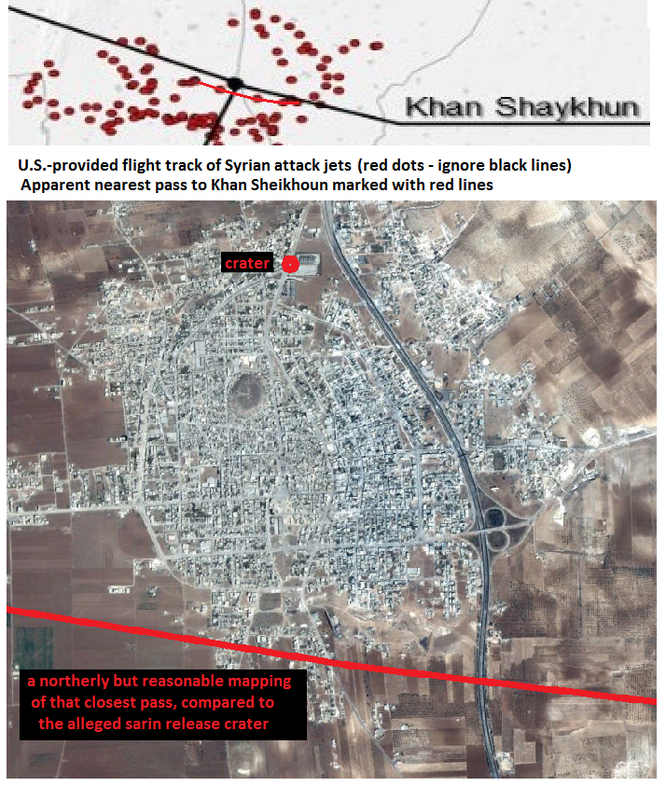 Let's start by considering the crude but perhaps adequate flight path graphic they provided as proof. (not the clearest version, here cropped a bit). I lean to the middle option. All evidence indicates there were at least three powerful explosions in Khan Sheikhoun at about this time - some minutes after sunrise at 6:16 as the sun was still low and from the east, three large plumes of smoke, consistent with conventional high explosives, rise above the city, as seen from the north. A jet is possibly heard at the video's start, apparently trailing off (departing). But we don't have proof that any passing jet actually caused these plumes. Note also, a stout white cloud, not a blast plume at all, is also just rising from near an apparent school just northeast of the tel (the big flat hill in the middle of town). Schools are often taken over by Islamist militant to store weapons, synthesize chemical weapons, and store hostages, among other things. 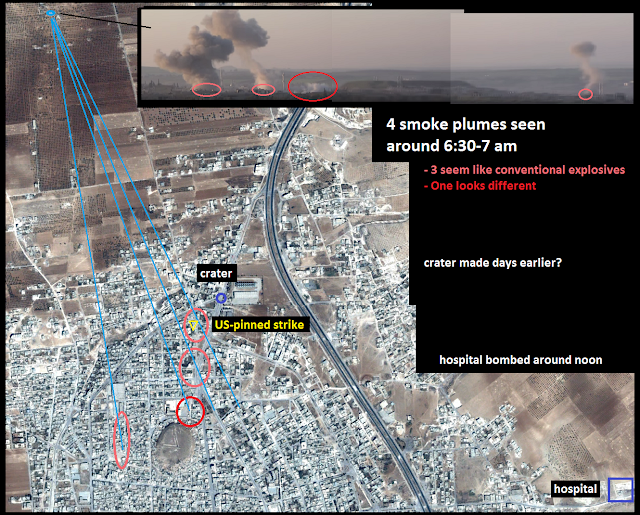 It's not clear this fog is sarin, or whatever people described (mostly as seeming yellow, not white... see below). Then, between 7:30 and 9 am or so, lots of dead people appeared at rebel collection points, never, in hundreds of cases, seen at the homes they mostly are said to die in. That's odd, and leaves open the possibility that they didn't die in their individual homes... Any link between this and the passing jet is at least as unproven as with the attack plumes. The White House cites one particular crater, that's hyped as poisonous, shown off in opposition videos as the main site, where people in paper face masks at best mill about the following day. The crater does appear new-ish, though the scene is ambiguous. The White House convincingly showed by satellite views it wasn't there in late February. But proof is lacking that it was hit on 4 April or, at least, during the alleged jet attack between 6:37 and 6:46. 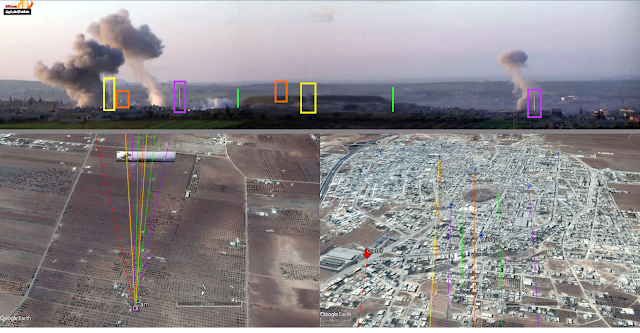 My graphic above is based on Bellingcat's careful line-of-sight work (from the evidence so far). They have minarets and other features lined up with the apparent filming spot north of town, like I've done before. The work seems sound and self-evident, so I didn't double-check it. It allows for rough placement of the plumes, as I've done above in pink circles (distance along each line isn't certain). Note: above I label crater in blue and "U.S. pinned site" in yellow. Ignore the yellow: I saw a blob of that color right there in the flight path graphic's little inset. But that was the yellow pin's head, I guess, with its invisible tip pointing to the crater they talk about, or meaning to (might point too far south). 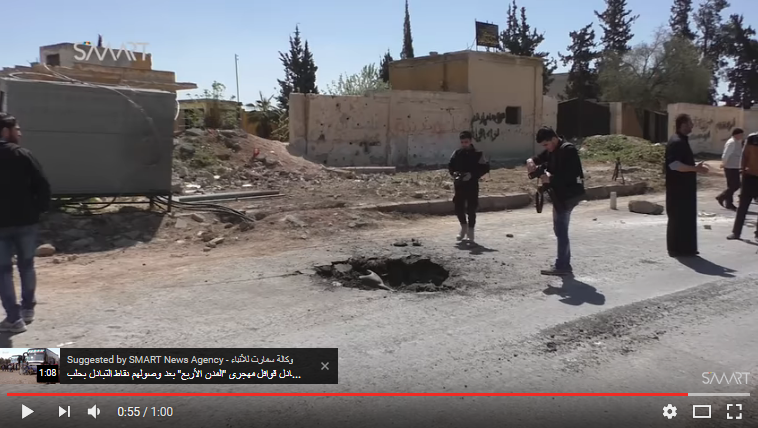 Note in Bellingcat's bottom left view (facing south) there's an added red line to the crater the White House speaks of. I can't prove it yet, but I don't think there's a plume there, at this time. Location: if the above placement isn't exact, this drove view will refine it. The video never pans far enough to the left to look down that red line of sight. I checked to be sure - see the little panorama inset in the lower left view - that's about as much as they show, its left edge stopping maybe half way to seeing what's above the crater area. 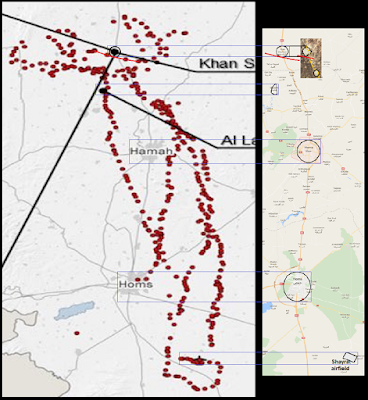 These remnants, combined with witness observations, the victims’ symptoms, and the identification of sarin as the chemical used in the attack by the French and Turkish governments and the Organisation for the Prohibition of Chemical Weapons, suggest that the Syrian warplane dropped a factory-made sarin bomb. According to open source material, the only Soviet-produced bombs designed specifically to deliver sarin are the KhAB-250 bomb, and its bigger version, the KhAB-500. Anyway, the KhAB-250, as they note, is an air-dropped bomb. It has no propulsion, and falls straight down, landing just ahead on the flight track from where it was released (from the initial momentum of the jet), and no more than a couple meters in any other direction due to wind. It won't fly a couple kilometers left or right. So either the U.S. flight track is wrong, or this thing cannot have been dropped as alleged. 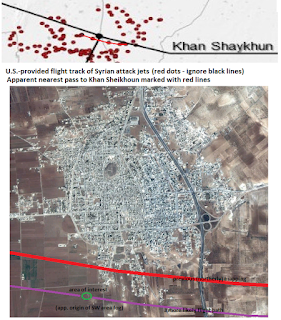 <Add June 29> Expanding on the flight path, I finally did a full-path correlation to show the radar track's map is apparently all to scale from takeoff to Khan Sheikhoun. In 3 images, here on Twitter. The town is bigger than I took, but my north-shift was more than adequate. A more correct line is considerably south of that, roughly as shown below, relative to current placements for all alleged or possible bomb spots, conventional or CW. The opposition sources have always claimed all weapons of both kinds were air-dropped bombs that only fall straight down, not missiles that can be fired at a distance and even change course. 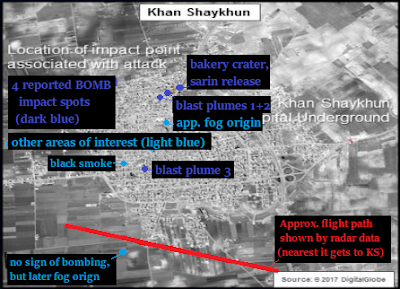 The 4 clearly claimed bomb drops are shown here in dark blue. But if the US radar track is to be believed, the jets never passed directly above any of them, nor even close to above them. One is about a kilometer north, and the other three about 3 km north. Consider if anything was offset, the jet(s) could have passed over city center. But we see nothing off, and this arc around the town makes clearer more sense than a pass right over and an arc way to the north or south. If anything, I'd say it's shifted a bit north, as that south pass is much closer than the rest of the arc. But separately, I located the mysterious source of the southwest area fog field, and it was close enough I tried setting the path right over it; maybe it was one target of the surveillance flight, because Syria suspected something was happening there. As it happens, this is closer to my new line than my old line was; the radar track runs between these two lines, but closer to the purple one. British foreign secretary Boris Johnson said the other day, via Hansard, "We know from shell fragments in the crater that sarin had not only been used, but that it was sarin carrying the specific chemical signature of sarin used by the Assad regime." By this, we think he's admitting it does not match Syria's surrendered stocks. If it did, he'd probably prefer to say that. Instead, he calls it a kind they've used. 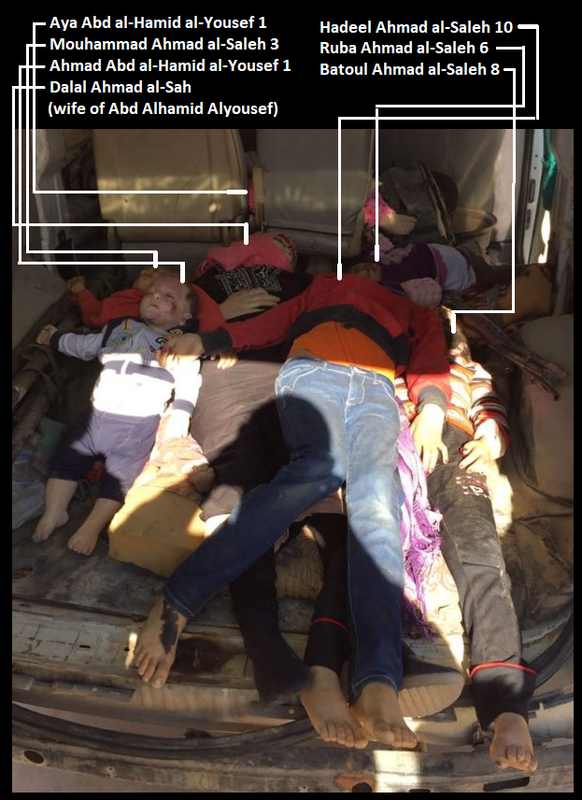 This includes what are in fact several terrorists uses of impure sarin, since March, 2013, falsely blamed on Syrian forces, even though they're the targets half he time. This was accepted as used by Syrian forces in the Ghouta attack of August 21, 2013, but evidence suggests that never did match with Syria's stocks, and the event has massive indicators of being a false-flag massacre carried out on hundreds of hostages, the ultimate in massacre marketing, that failed in part for being too obvious in that regard. So, Boris seems to be saying ... this is Ghouta 2.0, as it was already seeming to us.As there was no regime missile base link to prove it wasn't rebels behind Ghouta, we lack proof there was any link bgetween the Khan Sheikhoun attack and any jet, or the Shayrat airfield. We know beyond doubt that two Sukhoi-22 aircraft took off from Shayrat airfield, where we know chemical weapons are stored. I suggest this isn't independently known - Syria has allegedly given up all CWs, and shouldn't store them anywhere. When did the anti-Assad powers find out he was holding out on some sarin at a specific airfield? And why didn't they say anything about it until now? Really, I propose, they had someone deduce there was sarin there, since a jet from there dropped the stuff, then pretended that was its own intelligence to support that deduction. They note this doesn't amount to foreknowledge they should have acted on pre-emptively - and I can buy that. But is it even true? Additionally, our information indicates personnel historically associated with Syria's chemical weapons program were at Shayrat airfield in late March making preparations for an upcoming attack in Northern Syria, and they were present at the airfield on the day of the attack. In fact, perhaps just from this, CNN wire report.. The US now assesses that Syria has re-established a unit of personnel associated with chemical weapons that existed before the 2013 agreement in which the Syrian government pledged to give up its weapons inventory. And there is some indication they are getting outside help. I thought I had seen something about his flying chemical missions before, mainly chlorine. If so, that could be what makes him CW "personnel," and that alone might be their basis for that claim. B’cat said, “The earliest reference we have discovered ” was an [Apr 4] 8:21 local tweet referencing a video published at 7:59 a.m. But, it would seem, the actual “earliest reference” is the “spotter” who (at 6:26am) presupposes that the [SU-22] warplane, he identifies as it takes-off, is the pilot and aircraft implicated in a recent, earlier (March 30) incident. Based on that evidence, and quiet evening weather, the spotter determines then expressly warns, “Quds 1, guys he has chemicals, he has chemicals.” [I suspect the spotter was exclaiming more than just making a statement.] Maybe it’s semantics, but it seams significant [out of the ordinary, really]. The Times (UK) originated the story, my copy from an AU pub. They both have subscriber limits. report also says he recieved an award for his attack that day, but was named as Haitham Hassouri, maybe to conceal his identity in the publicized ceremony. A tweet was deleted! In the recording of the radio chatter, a monitor, named only as Hussam, detects a Sukhoi 22 fighter jet taking off from the Shayrat air base at 6.26am. The pilot identifies himself as “Quds 1”. Twelve minutes later Quds 1 drops the missile on Khan Sheikhoun. 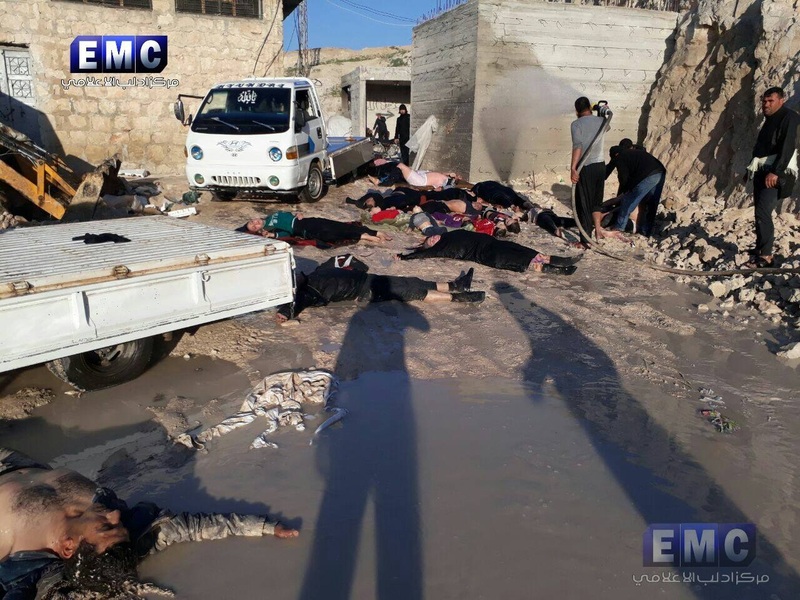 Latamineh, 15 miles from Khan Sheikhoun, was hit by a missile filled with what appeared to be a chemical agent on March 30. Doctors described victims suffering spasms and foaming at the mouth. About 70 people were injured, although none was killed. it's "missile," which is at least possible. No one ever takes off at 6:30 in calm weather unless it's to gas people? Really? What other time of day are the first post-dawn recon missions slated for? Or there's no such thing in this war? They scope it during the night and attack at first light?